Topic: What About the Lives That Are Saved by Guns? Today we have more updates and coverage of the Parkland, Florida school shooting plus the fallout because of it including proposed gun control bills in Florida, and at the national level as well. 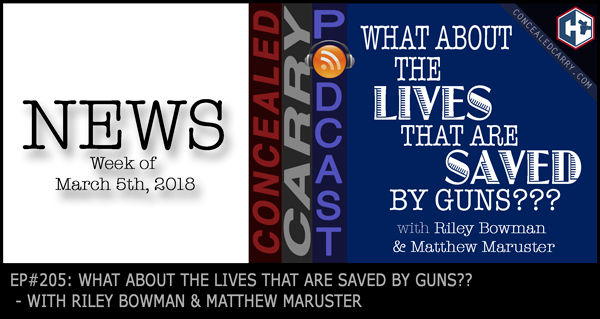 Also, don't miss out on our discussion about the lives that are SAVED because of guns being in the hands of law-abiding citizens as we share and talk about several JUSTIFIED DGU stories as well. Share this with all your friends and family! Please support by checking out Law of Self Defense at www.lawofselfdefense.com/concealedcarry and use the coupon code “CCP” for a special discount! How Many Lives Are Saved by Guns — and Why Don't Gun Controllers Care? What is Starbucks’ Gun Policy?